As much as we know you hate them, Emergency Roof Repairs are inevitable sometimes! Rockwall Metal Roofing aims to remove all the stress that comes with the necessity of an Emergency Roof Repair! Our Reliable Contractors and Subcontractors are coached and trained to thrive in Emergency Situations! 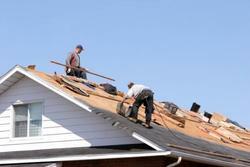 Specifically with you in mind, we strive to always be ready for any Emergency Roofing that might need our attention. From water damage to smoke damage, Emergency Roof Repairs are unavoidable. And with Emergency Roof Repairs comes Insurance calls! Let us help! We can talk directly to your Insurance and get you one step closer to your Roof Repairs, without the hassle! Our Contractors and Subcontractors are ready and eager to assist in the headache more commonly known as Insurance Policies! Give us a call NOW and get your Emergency Roof Repair FREE Estimate!